This security poster illustrates the Egyptian SACI Copy Anti-Tank Mine, which is an Egyptian copy of an Italian mine. This anti-tank mine is constructed from Bakelite. This mine also has three fuze wells and can be fitted with two types of fuzes. This security poster features the technical specifications of the Egyptian SACI Copy anti-tank mine, a sectioned Egyptian SACI Copy fitted with the spring loaded fuze, a side view of the Egyptian SACI Copy, and a labelled exploded view comparing the two fuzes. A sectioned Egyptian SACI Copy fitted with the spring loaded fuze. A side view of the Egyptian SACI Copy. A labelled exploded view comparing the two fuzes. The technical specifications of the Egyptian SACI Copy Anti-Tank Mine. 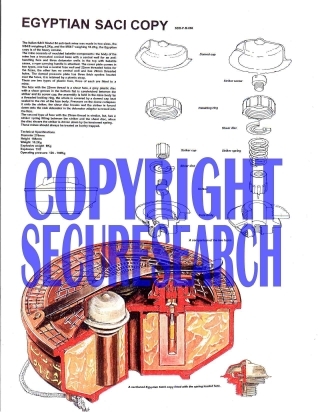 This security poster features the technical specifications of the Egyptian SACI Copy anti-tank mine, a sectioned Egyptian SACI Copy fitted with the spring loaded fuze, a side view of the Egyptian SACI Copy, and a labelled exploded view comparing the two fuzes.